Author’s Note: The Johannine Passion account of Good Friday is filled with many characters: Judas, Peter, Annas, Caiaphas, Barabbas, the Jews, the soldiers, Mary and “the disciple whom he loved.” However, at the center of this cast of characters is Pontius Pilate, and his interaction with Jesus. It reveals two kings with two conflicting understandings of what it means to be king. It inevitably results in a collision from which only one of them can emerge with a claim to legitimacy. Whoever is in charge has the last word. They have the power. They are in control. They “drive the bus.” Ask any coach, teacher, manager, CEO, or parent and they will tell you as much. Those in charge call the shots. Is that not what it means to be a king? A king is in charge. At the heart of Jesus’ ministry is his claim to be a king. As he heals the blind and turns water into wine, he claims divine authorization and the right to be in charge of everything and everyone, even death itself. However, from the very beginning there were those who disputed Jesus’ claim. In the Passion of John, that dispute plays out before our eyes. There we see two kings locked in combat, each trying to assert his power against the other, each claiming his own kind of divine authorization. However, ultimately only one can be king. Only one can be in charge. The same dispute rages in our lives. Two kingdoms, two ways of life, two kinds of power and two kinds of authority, each seeking to have the last word and be in charge. Step 2: Advanced Diagnosis (Internal Problem): Whom Do You Trust? Each seeks to gain our trust and loyalty in different, conflicting ways. One lives by the power of the sword, under the threat of death. The other lives by the power of foot-washing love, and unafraid of death. One coerces with threats. The other offers mercy. One believes that the weak must serve the strong. The other believes that the strong get to serve the weak. One demands that everyone must get what he deserves. The other dares to give people what they do not deserve. One demands that everyone must earn his keep. The other announces that we are the apple of God’s eye and children of God simply because Jesus says so. Pilate versus Jesus! Two different kings, two different kingdoms, two different ways of life and perspectives on what really matters and what does not—each claiming to be in charge. The question is . . . who is telling the truth? Whom do we trust? Unnerved and afraid, Pilate blows off Jesus’ claim. He cynically asks, “What is truth?” That he cannot wait for Jesus to answer betrays his encroaching fear. Anxious that his power is slipping away, he anxiously appeases the populace by convincing them that Barabbas is less of a threat than this royal pretender, Jesus. Pilate will show them all! He is in charge! Jesus is the pretender! When this scene in the Roman praetorium in Jerusalem ends, the answer seems clear. Pilate is king. He sentences Jesus to death by crucifixion. He is in charge, not Jesus. As Jesus hung there on the cross, Pilate added further insult to injury by posting over Jesus’ head a sign mocking Jesus’ claim: “Jesus of Nazareth, King of the Jews!” Ha! What king? What a pretender, this Jesus of Nazareth! A real king would come down from the cross. It was clear to all: Pilate and his kind are the ones really in charge. Jesus and his ilk are just pretending. Death is the last word that makes all of us cower in the end. Then … there is the rest of the story. 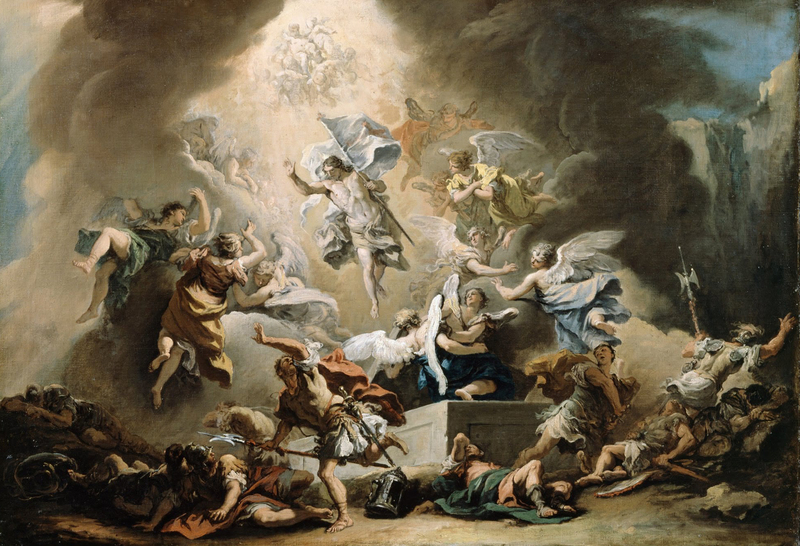 Three days later Jesus is raised from the dead. Despite appearances to the contrary, Pilate and his kind are not in charge. Jesus—and his Father who sent him—are! The sign that Pilate posted over Jesus’ head on the cross was not mockery but the truth! Jesus is King even on the cross. Jesus is in charge even as he dies. When Jesus utters, “It is finished,” he is not finished—Pilate and his ilk are! Not even death and the power of the world’s greatest empire can keep Jesus down. Jesus is God’s last word to the world. That last word is mercy and forgiveness . . . even for folks like us who repeatedly stray from the path chasing our gods, infatuated with the delusion that we can be in charge after all. In contrast to the portrayal of Jesus’ Passion in the synoptic Gospels, in John Jesus is always in charge. He remains confident that the Father has sent him, even though it seems that Pilate and the kingdoms of this world that imitate him are in charge. They threaten to send Jesus to oblivion and death. However, Jesus is fearless and unafraid. He trusts the good news that his Father is the one in charge even in the face of death. Because Jesus is in charge, that same confidence is ours. Like Jesus, unafraid of the threats of kings like Pilate, we can afford to die and let go of everything that kings threaten to take from us. Such things are not what give us life. We do not have to hold on to them as if they are all that matters. Because Jesus is in charge, we know that God is charge. That is the good news we can trust as audaciously as Jesus did. The threats of Pilate and his minions run off us like water off a duck. Our lives can no longer remain the same. Because Jesus is in charge, we are no longer stuck in this old world where “we always have to look out for ourselves because no one else will.” We find ourselves connected to others in ways we never expected. “Woman, behold your son. Behold, your mother.” We can create a community that earlier seemed impossible. We are slow to judge and quick to forgive. We are generous instead of stingy. We welcome all into our midst with no strings attached. We can speak one on one with those with whom we have differences. We do not need to gossip . . . or “triangulate.” We can speak the truth in love.